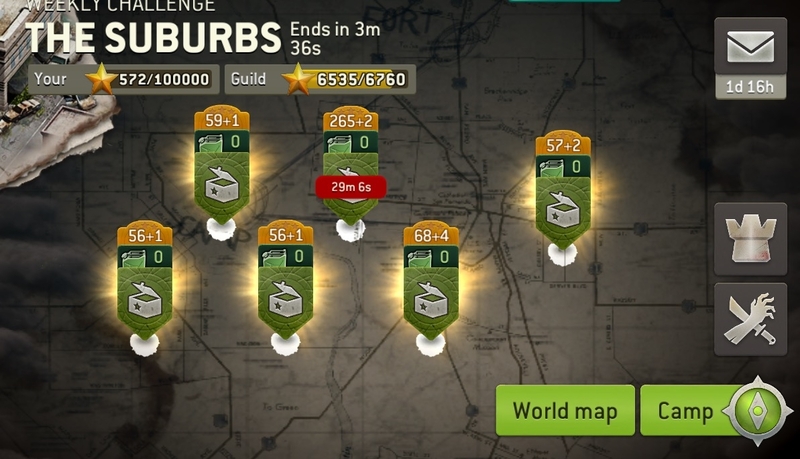 How to get more stars during guild missions? I play daily sometimes a few times a day and want to know if there is a trick to getting more stars during guild missions? Play, Play & Play some more. 4 - Some quests are harder than others. So when you get to the higher levels, you are going to get injured. Do these with the last of your gas, so you survivors have time to heal while you gas is refuelling. Depending on what level you are. I wouldn't worry too much about buying the unlimited gas. You might find by the last day of the challenge, they are have become too hard anyway. Thank you. I play until my gas is empty and then play again when full. Have not gotten the unlimited gas yet didn't realize there was one. Lol thank you for the heads up. @Lovingvampiress also with quests giving bonus stars, you can gamble on getting more stars by earning 2 bonus stars and the deleting that quest and hoping for another quest that gives you a chance for 3 more stars. So you can do 2 and gamble which will get you 5 total upon successful completion of the quest. However it's a gamble because the quest you delete after getting 2 stars could be the "complete exploration" quest or similar which doesn't give bonus stars. @AlexC that's a little vague, can you be more specific? 7.) do you have enough gold to burn? @masmith93 ok, a little more specific, but you'll have to put a little effort to investigate on the strategy yourself . @AlexC Feel free to join the guild Asylum any time. Oh you already are in a guild? Leave them immediately! @bgbelden I'm quite happy with my guild, but thanks for the offer!